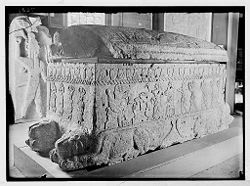 A sarcophagus (plural:sarcophagi) is an above ground stone container for a coffin or dead body that often is decorated with art, inscriptions, and carvings. First used in Ancient Egypt and Ancient Greece, the sarcophagus gradually became popular throughout the ancient world. It carried over through the later years of European society, often used for high status members of the clergy, government, or aristocracy. Made of stone, these sarcophagi have endured through the centuries and provide valuable information for archaeologists regarding the lives of those who lived in ancient times. Often decorated with artwork on the outside, they display the creative talents and ideas of the times as well as providing significant information regarding the lives and times of the deceased whose remains they contain. Such cultures revered their dead, often preserving their mummified body within the sarcophagus as well as including items of value for them in the afterlife. The external decorations often recorded the deceased’s achievements. Thus, sarcophagi are one of the significant items that reveal information about the lives of those long past, lives that often continue to impact human society even today. The word sarcophagus comes from the Greek "sarx" meaning "flesh," and "phagien" meaning "to eat," so that sarcophagus, literally translates as "eater of flesh." The fifth century B.C.E. Greek historian, Herodotus, noted that early sarcophagi were carved from a special kind of rock that consumed the flesh of the corpse inside. In particular, coffins made of a limestone from Assus in the Troad known as lapis Assius had the property of consuming the bodies placed within them, and therefore was also called sarkophagos lithos (flesh-eating stone). All coffins made of limestone have this property to a greater or lesser degree, and the name eventually came to be applied to stone coffins in general. 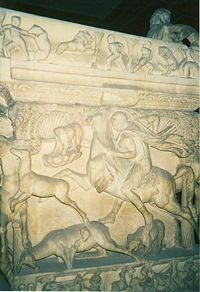 Detail of a stone sarcophagus in the Istanbul Archaeology Museum showing a hunting scene. Sarcophagi differ in detail from one culture to another. They are almost always made of stone, limestone being the most popular, but sometimes of granite, sandstone, or marble. Sarcophagi were usually made by being carved, decorated, or constructed ornately. Some were built to be freestanding above ground, as a part of an elaborate tomb or tombs. Others were made for burial, or were placed in crypts. The earliest were usually simple box shapes that could be inscribed upon. This was common in ancient Egypt, where a sarcophagus was usually the external layer of protection for a royal mummy, with several layers of coffins nested within that also served to protect dead bodies. Over time, the artistry on these boxes became more detailed to include inset sculptures, seen frequently in Roman, and later, Catholic sarcophagi. The sculptures would often depict a scene from mythology, or in the case of Catholicism, scenes from the Bible. Some sarcophagi actually began to take on contours similar to the human body, and often were given a painted or sculpted face. Following are a few examples of notable sarcophagi from around the world. Funerary chapel found in Tutankhamun's tomb in the Valley of the Kings (KV62). This was the outermost of the four chapels; the innermost one contained the pharaoh's sarcophagus. Perhaps the most recognizable of all Ancient Egypt's pharaohs, Tutankhamun's sarcophagus has proven to be just as famous as the boy whose remains inhabited it. Discovered in 1923 by Howard Carter, the large sarcophagus held within it several wooden coffins, that were inlaid one inside the other, the innermost one containing the mummified body of the boy king. The sarcophagus was of the old Egyptian simple style, a large box structure, which contained a more elaborately decorated, and more fragile, set of wooden coffins. Thus the sarcophagus was used primarily to protect the wood coffins and mummified body from the elements. 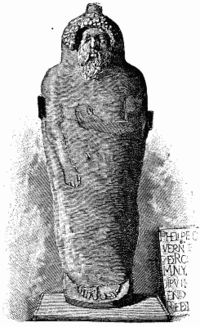 One of the ancient kings of Phoenicia, Ahiram (King of Biblos as he was known then) was sealed in a Late Bronze Age sarcophagus during the early tenth century B.C.E. Upon discovery, the sarcophagus was subsequently moved to the Beirut National Museum, where it is on display. To archaeologists, the sarcophagus represents a rare discovery in early Phoenician art and writing. It is also a classic example of the blending of styles, in which the box style sarcophagus is used, but intricate artwork is added around the sides. Coffin which Itthobaal son of Ahiram, king of Byblos, made for Ahiram his father, when he placed him for eternity. Now, if a king among kings, or a governor among governors or a commander of an army should come up against Byblos and uncover this coffin, may the sceptre of his rule be torn away, may the throne of his kingdom be overturned and may peace flee from Byblos. And as for him, may his inscription be effaced. The Sarcophagus of the Spouses (Italian: Sarcofago degli Sposi) is a late sixth century B.C.E. 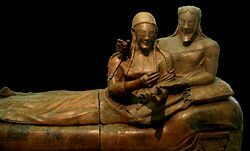 Etruscan anthropoid sarcophagus. It is 3.7 feet (1.14 meters) high by 6.2 feet (1.9 meters) wide, and is made of painted terracotta. It depicts a married couple reclining at a banquet together in the afterlife (in a scene similar to that from contemporary Greek vases) and was found in nineteenth century excavations at the necropolis of Cerveteri (ancient Caere). It is now in the National Etruscan Museum of Villa Giulia, Rome. The smiling faces with their almond shaped eyes and long braided hair, as well as the shape of the feet of the bed, reveal Greek influence. The marked contrast between the high relief busts and the very flattened legs is typically Etruscan. The Etruscan artist's interest focused on the upper half of the figures, especially on the vibrant faces and gesticulating arms. It portrays the affection of a man and a woman, an image never before seen in the Greek culture. The so-called Sarcofago di Stilicone ("Stilicho's sarcophagus") is an Ancient Roman paleochristian sarcophagus dating from around 385 C.E., sculpted for a high-ranking military authority and his wife. It is preserved beneath the pulpit of Saint Ambrose Basilica in Milan, Italy, in the same spot where it was originally placed, which makes it the only part of the original paleochristian basilica still in place. 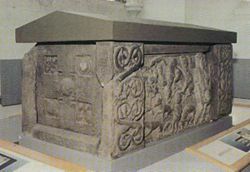 Saint Andrew's Sarcophagus is a Pictish monument dating from the middle of the eighth century. The sarcophagus was recovered beginning in 1833 during excavations by St. Andrew's Cathedral, but it was not until 1922 that the surviving components were reunited. The sarcophagus is currently on display at the Cathedral museum in St. Andrews, close to the site of its discovery. As originally constructed, the sarcophagus would have comprised of two side panels, two end panels, four corner pieces, and a roof slab. The roof slab is entirely missing, as are most of one side and one end panel and a corner piece so that the extant sarcophagus is essentially L-shaped. The external dimensions of the sarcophagus are 5.8 feet by 2.9 feet with a height of 2.3 feet. The stone used is a local sandstone. The surviving side panel shows, from right to left, a figure breaking the jaws of a lion, a mounted hunter with his sword raised to strike a leaping lion, and hunter on foot, armed with a spear and assisted by a hunting dog, about to attack a wolf. Although it is not certain that the first two figures represent the same person, nineteenth century illustrations depict them as if they are. The surviving end panel is much simpler, essentially a cross with four small panels between the arms. The fragments of the missing end panel are similar, but not identical, to the surviving one. Ariadne and Dionysus. Front panel of a marble sarcophagus, early third century C.E. Found in 1804 at Saint-Médard d'Eyrans, France. Mummy cartonnage bearing the name of Dame Tacheretpaankh. Glued, stuccoed, and gilded layers of canvas, third to first centuries B.C.E. Nuremberg, Ludwig Andreas Feuerbach, Sarcophagus, from the northeast. Sarcophagus of Archbishop of Olomouc Leopold Prečan in the crypt in Sts. Cyril and Methodius's church in Olomouc (Czech Republic). Top of a sarcophagi in Laon's cathedral, Aisne, France. The grave of the famous Major Franz Adickes of Frankfurt, Germany. Lid of an Etruscan sarcophagus. Museum Santa Maria della Scala, Siena. Sarcophagus (Third Century), portico of Santa Maria in Trastevere, Roma. Porphyry Sarcophagus of Emperor Constance of Sicily (1154-1198), in the Cathedral of Palermo (Sicily). Picture by Giovanni Dall'Orto. Tomb of Marcellus II, "grotte vaticane," Basilica di San Pietro. Istanbul Archaeological Museum. The so called "Sarcophagus of the Mourning Women." From the Royal necropolis of Sidon, fourth century B.C.E. Weddings of Dionysos and Ariadne. The Latin inscription identifies the girl for whom this sarcophagus was made as Maconiana Severiana, a member of a wealthy senatorial family. Ariadne's face was probably left unfinished to be completed as a portrait of Maconiana. ↑ The American Heritage® Dictionary of the English Language, sarcophagus. Retrieved October 5, 2007. ↑ Beruit National Museum, The Bronze Age. Retrieved October 5, 2007. ↑ Williams, Yona, Ancient Etruscan Art. Retrieved October 5, 2007. This page was last modified on 2 April 2008, at 15:55.